Nathan Gaisford is a wonderful husband and father to our two-year-old daughter, Avery. They love to wrestle and play hide and go seek together. He hopes she will follow in his footsteps and go to bible school someday. Nathan recently found out from his doctors that he is in dire need for a second kidney transplant. Nathan was born with two abnormal kidneys. In November 1990, at the age of ten, Nathan had his first transplant. His mother’s kidney was a perfect match. That kidney lasted for 26 years, which we know is a miracle. However, Nathan now needs another kidney transplant to be in good health and lead his normal life. Nathan has finished the evaluation process and is now on the transplant wait list and can start receiving kidney offers. But we are in search of a living donor as well. Nathan started dialysis three times a week in December due to his kidney function continuing to drop.Transplants are life-saving procedures, but funding for the transplant is a monumental task. There will be many medical costs not covered by insurance: co-pays, anti-rejection medications, relocation and travel expenses, which can easily become a huge financial burden for any family. This is where your help is desperately needed. To help offset Nathan’s uninsured expenses, a fundraising campaign in his honor has been established with Help Hope Live, a trusted non-profit organization that has been providing community-based fundraising guidance to patients and their families for more than 30 years. All donations are tax deductible to the full extent allowed by law, are held by Help Hope Live in South-Central Kidney Transplant Fund, and are administered by Help Hope Live for transplant-related expenses only. To make a donation to this fundraising campaign, click on the Donate Now button. We are currently working hard on organizing fundraisers. Please follow Nathan’s progress and learn about upcoming fundraisers by continuing to visit his campaign page. Our family is trusting God in the whole process. Whether his healing comes through a miracle or through transplantation, everything will be to the glory of God. On behalf of Nathan, myself and our families thank you for your ongoing prayers, support, love and generosity. As of 1-25-17 Nathan is on the transplant list! We are desperately searching for a living donor! If you are interested in becoming a living donor please contact the living donor coordinator Leslie at 405-271-7498 and leave a message saying you interested in becoming a living donor for nathan gaisford. Praise the Lord! Nathan received the letter. He is officially on the transplant wait list! The doctors say average wait on the wait list is 3 to 5 years. We are children of God and we have his favor over us and I know that supernaturally that God is lining stuff up right now and that Nathan will have a supernatural wait time a short one and he will be a living breathing testimony. So men and women of faith standup and believe with us that he is on a supernatural waitlist because we are Gods Children that we have supernatural favor for short wait time! Nathan started dialysis treatment three times a week on December 22nd due to his kidney function continuing to drop. 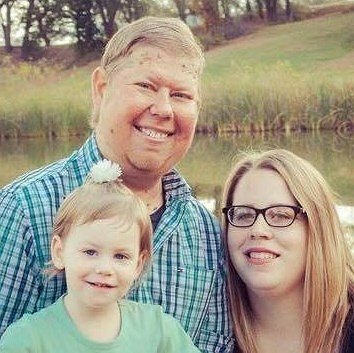 He has to drive to Enid (an hour and half away) three times a week until he receives a transplant, which we hope he will be soon. His doctor says that he taking dialysis very well. He hasnt had any nausea or vomiting. We are continuing fund raising to exceed our goal to help with gas and food for Nathan’s dialysis treatments. Which adds up and is costly. We thank you for your continued support and prayers. We are praising God today! We just got word that Nathan’s mold that they removed came back atypical and non cancerous. Please pray for Nathan. He goes in today for an biopsy for a mole. Believing for a good report. He also starts dialysis Thursday. Nathan meets with the surgeon the 29th and then he meets with the doctor again in December and then he should be put on transplant list sometime after that ( probably around the first of the year).Once he is on the list then we can start getting possible living donors tested to see if they are a match. Nathan will continue doing weekly lab work in the mean time. Nathan has a wife and very active two year old daughter. Your contribution helps to get nathan in good health and helps him to be able to be play and rough house with her (one of there favorite activities to do together other than hide and go seek). Also most of all it helps gives him a long life the where can he see he daughter grow up and get married or go to college (he hope she will follow in his Footsteps and go to bible college). Your contribution gives him more than just money it gives him time and memories. Please stand in faith with us on getting Nathan a second kidney transplant and healing. We are trusting and believing God for a complete healing to manifest whether that is through a miracle or through a transplant. Unfortunately insurance will not cover all the costs covered in a transplant so we are trusting God and believing him for the funds to come in and humbling ourselves and are asking the hard working people of our community to help raise those funds. We will appreciate anything you can give. I read your story on the Alumni page and I want you to know your Rhema Family is behind you spiritually and financially. God is a miracle working God and He will prove himself faithful to you once again! Praying for you and helping to spread the word for more support!